At least two artists share this name: 1) Canadian jazz pianist, (June 9, 1957- ) 2) American entertainer, (May 10, 1922 ? March 25, 1992): Born Anna Myrtle Swoyer in Philadelphia, Pennsylvania, USA, in 1922 (although some sources have cited 1921), she held a life-long feeling of abandonment by her mother, who died while she was an infant. She and her sister, Betty Lou Barto, grew up in large cities where their father, who was a performer, entertained in vaudeville. Walker made her Broadway debut in 1941 in Best Foot Forward. Born Anna Myrtle Swoyer in Philadelphia, Pennsylvania, USA, in 1922 (although some sources have cited 1921), she held a life-long feeling of abandonment by her mother, who died while she was an infant. She and her sister, Betty Lou Barto, grew up in large cities where their father, who was a performer, entertained in vaudeville. Walker made her Broadway debut in 1941 in Best Foot Forward. The role provided Walker with her film debut when a movie version, starring Lucille Ball, was filmed in 1943. A subsequent appearance was in the MGM musical Broadway Rhythm, in which she had a featured musical number, "Milkman, Keep Those Bottles Quiet." This song was written especially for her by Leonard Bernstein. A diminutive four feet, ten inches (1.50 m) tall, Walker was difficult to cast; however, thanks to her dry comic delivery, she continued acting throughout the 1940s and 1950s and was nominated for a Tony Award in 1955. Dozens of television guest appearances and recurring roles followed, providing her with steady work. Her career spanned five decades, and included comedies, dramas and television variety shows such as The Garry Moore Show and The Carol Burnett Show. Walker co-starred with Phil Silvers in the 1960 musical, Do Re Mi. She achieved her greatest success playing Ida Morgenstern, the mother of Valerie Harper's Rhoda Morgenstern, initially in a number of guest appearances on the Mary Tyler Moore and then as a regular in its spinoff, Rhoda. During much of the time she was co-starring in that hit situation comedy, she was also a regular on the successful Rock Hudson detective series McMillan and Wife, portraying Mildred the maid. These two roles brought her seven Emmy Award nominations. 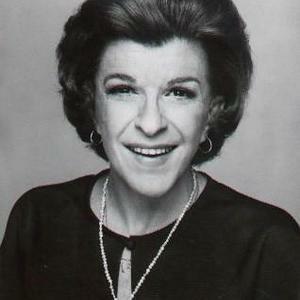 She also starred in two short-lived situation comedies, Blansky's Beauties and The Nancy Walker Show, both during the 1976-1977 season, giving her the rare distinction of being in two failed series within the same year. She returned to Rhoda (from which she'd departed a year earlier) at the beginning of the 1977-1978 season, remaining with the show for the rest of its run. During this time, Walker started to direct episodic television, including episodes of The Mary Tyler Moore Show, Rhoda and Alice. One of Walker's last major film roles was as the deaf maid, Yetta, in the 1976 all-star comedy spoof Murder by Death. She continued to remain active in show business until her death, playing Rosie, a New Jersey diner waitress in a series of commercials for Bounty paper towels from 1970 to 1990. She helped make the product's slogan, "The Quicker Picker Upper", a common catchphrase. Among her final appearances in a television series was the recurring role of "Aunt Angela", Sophia Petrillo's widowed sister, on The Golden Girls for which she received an Emmy Award nomination. In 1980, Walker made her feature film directorial debut, directing disco group The Village People and Olympian Bruce Jenner in the pseudo-autobiographical musical Can't Stop the Music. The film was a box office failure, although it later became something of a camp/cult favorite. This was the only theatrical film ever directed by Walker. Released too late to cash in on the disco craze that had swept the nation and savaged by reviewers, it still pops up on "worst movies" lists. In the early 1980s, Walker directed for the Burt Reynolds Dinner Theatre in Florida, and acted in The Gin Game in a theatre in Denver.